It's no secret that we have always had trouble getting our older Shiba to walk. He frequently lays down in protests and has always been like this since the first day he came home with us in March 2009. In fact, I had another blog post with the same title from July 2010. It was cute and funny at first but like most things that start off with that description, the behavior quickly got old and frustrating. Alas, we thought that this is what we thought our Shiba is and what he will be forever so we accepted it and moved on by avoiding taking shorter walks and going to the dog run to let him play off-leash. However after we moved to Brooklyn, things changed and he didn't run around in the local dog run. Less energy was spent and he still didn't like to take long walks with me. We played indoors and let him be since we heard that Shibas' personalities change as they grow into their adult selves. When Emi came, things changed. Emi had a lot of energy and once she became acclimated to her new home in Brooklyn, we needed to be able to take long walks with both dogs outdoors so that Emi could face her fear of the new noises and people. Shio, having far less energy, was not pleased with long walks and would frequently lay down to remind us how much he hated walks. That's when it was decided that it was time to retrain him because we needed him to cooperate with us. We also hired a dogwalker so that they can socialize with other dogs and be taken around the neighborhood with an experienced person who can handle them. The neighborhood walker that we hired is also a dog trainer and it helped us because he understood our Shibas' personalities more than we did after time. I would catch up with him for reports on how they did and never once has Shio laid down in protest with him. They've been walking together since April and not one protest while I have to get Shio off the ground on at least twice during a 30 minute walk. The dogwalker mentioned that training Shio would be most difficult for us since he's accustomed to behaving this way with us for 3 years now and it'll take time to change his way. 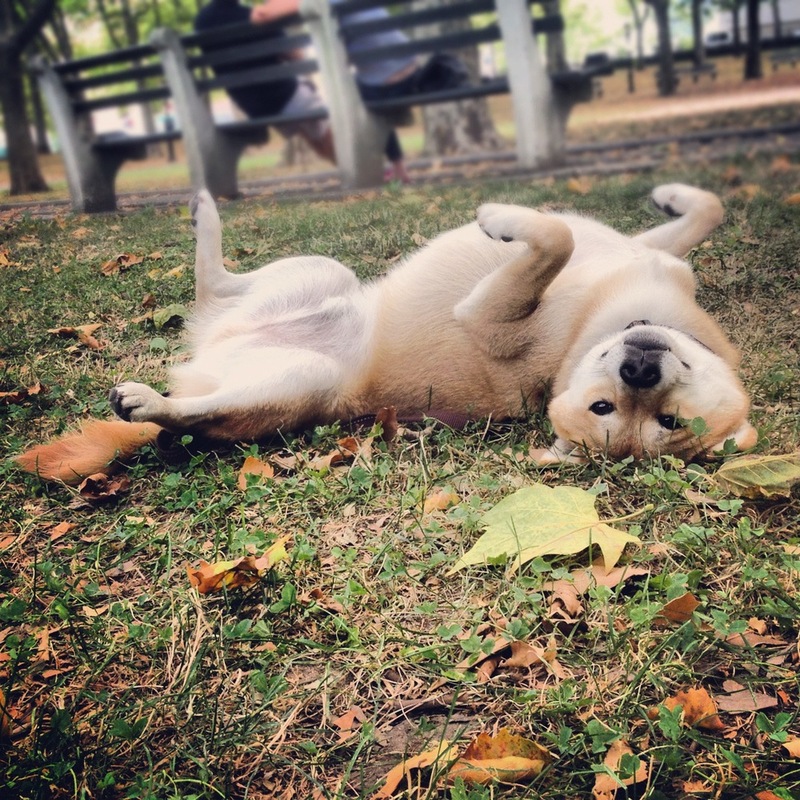 Times that amount of time by a thousand for retraining a really stubborn Shiba. In June we started on our training journey and never looked back. June came and went and I would be mentally and physically exhausted after walks with the two dogs. Day after day Shio and I played tug of war while walking and Emi hung around my legs frightened by the joggers and children in playgrounds. Most days I would be frustrated and my right forearm would hurt from the strain and we'd all flop down in the living room in exhaustion afterwards. Most of July was the same but at some point during the month I realized that I was able to handle the protests with a better sense of humor and coerce Shio to getting back up much quicker. I also noticed that Emi was less frightened by the noises and people in the park. Walks were cut shorter due to sudden rainstorms or extreme high temperatures. I had Shio walking 3 miles a day by the end of July and I thought that would be the best it was ever going to be. While chatting with dogwalker this week, he told me that Shio "enjoys walking." I asked him if he had the correct dog in mind and laughed it off. However his words resonated in my mind. Could Shio, the Shiba that would rather lay in the middle of the road then walk, really enjoy walking?! Yesterday I set out with a different attitude, one that was happy to go out on a walk with my two crazy dogs rather than one where I was just dragging two dogs outdoors, and it worked. I have two dogs that are happy to follow me on walks and happy to be outdoors with me. Can you believe it? I can't but I have photographed evidence. The journey to get here was rough but I'm happy we made it. Tired pups are the best.